Fotoflōt, a new and unique way to display photos. fotoflōt displays prints without glass, eliminating reflections and glare. 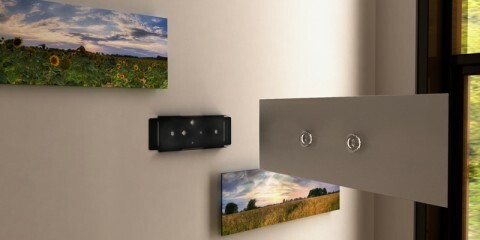 It has a magnetic mounting system that lets you change images in seconds and floats the photo off the wall or desk, subtly emphasizing the image. And the first thing I will fotoflōt (will this become a verb like google?) is our ugly circuit breaker box at home, just like Kerri Ellis did. It looks cool, but… your prints may not last too long using this method. The 2 biggest factors in print fading are light and air pollution. Both of these things are significantly reduced by a good piece of UV coated glass. Depending on the quality of the print and its location in your house / office, your prints could be pretty faded in a matter of months. industry’s “gold standard” for testing of photo paper durability. either light or air pollution. extended periods of time, as no display method can prevent fading under those conditions. lifetime warranty. We will produce another fotoflōt for any defect, including fading over time. It’s not as snappy as it seems: every photo you want to mount has to be prepared by Fotoflot (read: printed and mounted on a special fotoflot board). So you have to order a collection of pictures (all of the same size and aspect ratio). i like the idea of this. i gotta have this one too! Fantastic! Ooh, but spendy! It looks like my photo that I’d like to “float” from a photographer won’t work with this system since I already own the print…hmm…I’ll look for another option for it. :) Definitely bookmarked, however!